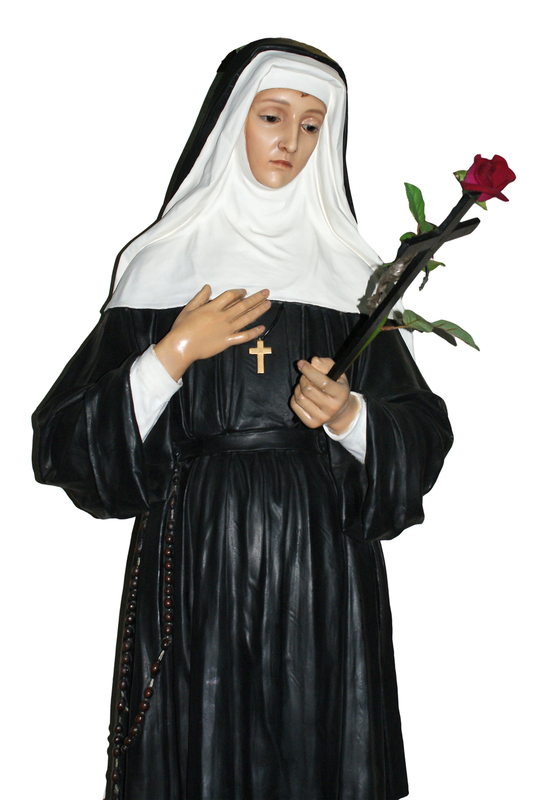 St. Rita of Cascia is the patron saint for St. Rita Catholic School. Rita was born in 1381 at Roccaporena near Cascia, Italy. When quite young, she felt the call to enter religious life, but at the age of fourteen, she was promised in marriage by her parents to a young man of good will but rather restless by nature. Through her own goodness Rita was able to smooth over the rougher side of her husband's character, and they lived in harmony for about eighteen years until he was murdered. Rita not only forgave his killers, but prayed to God that she would prefer the death of her sons rather than see them revenge the crime. As it happened, both died shortly after their father. Now totally alone, but filled with love, Rita thought of fulfilling her longings of her youth by seeking admission into religious life. Having overcome formidable difficulties, she was received by the Augustinian Nuns in Cascia. Here she lived for her remaining forty years of life. Throughout the final fifteen years she bore the mark of a thorn of Christ's passion. Rita died on May 22, 1456, which is observed as her feast day. She was noteworthy in that she experienced all the possible states of life, and overcame the difficulties of each with a generous love and a profound spirit of penance, while always being a peacemaker and a helper of divisions. Her incorrupt body is preserved in Cascia in the shrine which now bears her name. In the months before her death, Rita asked a relative visiting from her hometown to bring her a rose from the garden of her parents’ home. Although it was a small request, it was an impossible one to grant in the middle of winter. Nevertheless, when the woman returned home, she discovered a single brightly-colored blossom on the bush where Rita said it would be. She picked it and returned immediately to the monastery and presented it to Rita who gave thanks to God for this sign of love. St. Rita is known as the saint of the rose and the patron saint of impossible causes. Father of us all, you hold the world in one hand and bless it with the other. You gave Rita the strength to bear her cross after the example of Christ. She found peace in doing your will and was thus enabled to forgive others and bring peace to many. Give me the strength to accept my sufferings; let me not whimper nor forget the examples of strength that you give me in the lives of your saints. Bring peace to my heart, so that I too may be a peacemaker. For all your gifts let me thank you each day. Amen.